Zolushka was discovered in 2012 totally alone and with a frostbitten tail. Thanks to the International Fund for Animal Welfare (IFAW), Zolushka (whose name means Cinderella in Russian) was rescued and rehabilitated in 2013, after her mother was likely killed by poachers. She was then rereleased into the wild, with the hope that she'd be able to thrive on her own. 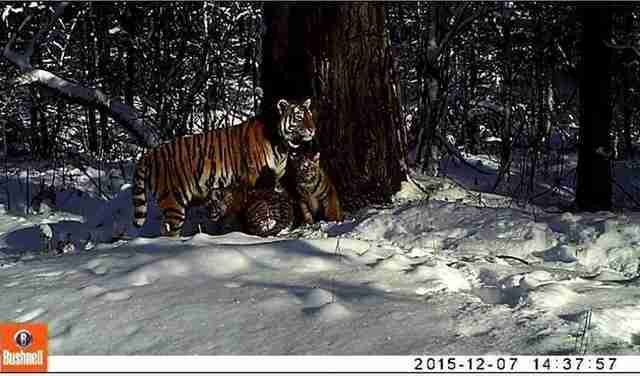 Two years later, on Monday, motion-sensing cameras in Russia's Bastak Nature Reserve caught an incredibly exciting picture of what Zolushka looks like now - with her two young cubs. Zolushka is the first-ever rehabilitated Amur tiger to give birth to cubs in the wild. The photograph snapped just the other day provides "historic" proof of her successful reintegration to the wild, according to a press release from IFAW. The Amur, or Siberian, tiger is incredibly rare. Because of poaching and habitat loss, only about 500 of these beautiful animals remain in the wild. With the birth of these cubs, the population of tigers in the nature reserve where Zolushka lives has doubled. "We are overjoyed with the news of Zolushka becoming a mother to two healthy cubs," Masha Vorontsova, director of IFAW Russia, told The Dodo in a statement. "This is what we've all been hoping for since her release in 2013. This shows that she has fully adapted to a life in the wild and is able to successfully hunt, breed and now raise a new generation of Amur tigers."